All prices include: flights, transfers, accommodation and meals; all as listed. What is not to love about this option? 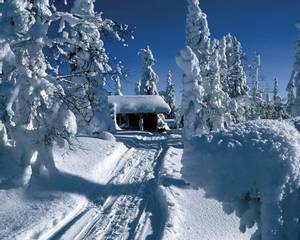 A homely log cabin and a choice of activities - perfect for couples who want to create their ideal winter programme. Choose how to make the most of your free time by using the hotel swimming pool, the downhill ski slopes or the endless miles of cross-country ski slopes. My favourite place is Luosto, the unique log cabin village with the magnificent landscape and peace of Pyhä-Luosto National Park. The Luosto area is known for its majestic old-growth pine forests and Pyhätunturi for its geology and Sámi history. The fell chain is a collage of treeless peaks and deep ravines. Lush forests, some of them herb-rich forests, flourish in the area's valleys and along brook banks. Hiking in the summer/autumn and cross-country skiing are my favourite ways to explore. Put together your perfect Lappish trip to Luosto Finland for a minimum of three nights. Fill your time with as many activities as you’d like including dog sledding, snowmobiling and Northern Lights hunting. 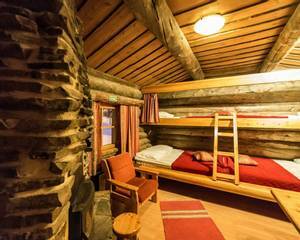 Return to your cosy log cabin every night, complete with private sauna and crackling log fire. Luosto is a well-kept secret that exceeds everyone's expectations of Lapland. This small ski resort brings together everything you want to experience in this part of the world and more. From a minimum of three nights with the option to add additional days, you can design your own holiday filled with your choice of activities from an impressive list. In addition to snowmobiling and husky sledding, more traditional pastimes like cross-country skiing and ice fishing can be experienced. Whether it be meeting the reindeer, venturing out on snowshoes or spending a day on the slopes, the choice is yours. When you want to relax you can head to your cabin's private sauna, or the hotel's pool and spa facilities, which can be added to your package. Witnessing the Northern Lights is a once-in-a-lifetime experience but it is, of course, the one thing you cannot book in advance! However, the good news is that Luosto is a prime Aurora location so you may well be fortunate enough to add this to your list of achievements too. Before you turn in for a wonderful night's sleep in this cleanest of air, you can warm up with a sauna and sit by the log fire in your snow-surrounded cabin (a short walk from the main hotel). Your cabin has a kitchenette and dining area. The cabin contains two large double beds which are positioned end to end and with two single bunk beds on the upper bunk (accessible by ladder), making them ideal for a couple or a small group. Prices include flights, transfers, half board accommodation for three nights. Cold weather clothing is also provided for the duration of your stay. All activities are individually priced. Each person who books five or more activities in advance of travel (excludes accommodation upgrades and equipment hire) will receive a 5% discount on the total price of their activities. Please note: some activities require a minimum number of participants to operate, schedules are always subject to change and are subject to availability. Luosto is a charming ski village in Finnish Lapland with a picturesque backdrop of forested fells and frozen lakes, making it the ideal winter retreat. With its handful of shops and cáfes, the village manages to maintain a traditional Northern Finnish feel and the guests have easy access to local facilities. 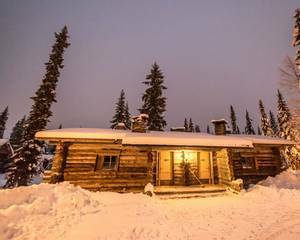 The Luosto Log Cabins are owned by the Luosto Tunturi Hotel, which is one of only two hotels in Luosto. They are just a short walk from the main hotel building, so you are within easy reach of Tunturi's facilities. The Tunturi Restaurant (used for the majority of our packages), serves a wide range of local and international dishes in buffet style. There are seven neighbouring downhill ski slopes and ski hire is available locally. The hotel will also help you arrange ski passes. Also, cross-country skis and snowshoes can be hired locally for you to explore the variety of trails surrounding the hotel. 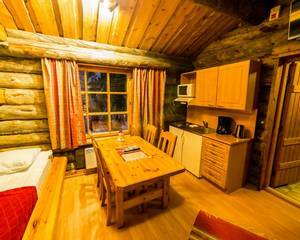 Log cabins: The log cabins are situated just a short walk from the hotel and are perfect for a private retreat. The cabins are ideal for a couple. The cabins are comprised of essentially one main room with a kitchenette, dining area and a television. A cosy wood burning stove provides a warming centrepiece. The beds are arranged in a unique bunk format with the lower bunk formed of two double beds and the upper bunk housing two single beds. Each cabin is en-suite with a private sauna. Please note: pool, spa and gym usage is not included when you stay in a log cabin, however, this can be added to your package. Please speak to our Travel Experts for further details. Experience the ultimate dog sled trip as your eager team leads you on an overnight wilderness adventure. After full instruction, you will set off into the wilds with your guide leading the way. Everyone will travel with their own sled and team of dogs and so this is a real hands-on experience from start to finish. Your destination is a wilderness cabin where you will enjoy an evening of campfire cooking and camaraderie. There's no running water out here, nor electricity, so this is a real back to basics experience – but one you will never forget. All guests will help collect firewood and prepare the meals before staying in the dormitory accommodation. This safari offers the best opportunity for guests to really bond with a team of dogs as you will spend a full 24 hours in their company. The distances travelled will depend entirely on the conditions but you should expect to cover around 20km per day. Guides, instruction, dinner, breakfast and equipment included. Hotel Aurora's ten rooms will bring guests closer to the Finnish Winter's polar nights in total comfort – with high-quality features, fully-equipped bathrooms and great views. Guests will enjoy dinner in the delightful restaurant at Hotel Aurora and breakfast the next day is also included. Standard prices are based on guests spending their first or final night in the Arctic View Rooms. You will, therefore, be asked to check out of your previous hotel room or cabin on the morning before your stay. If you would prefer to keep your hotel room or spend a different night in these unique rooms (or indeed if they are fully booked for your final night) supplements will apply. You can of course also choose to spend an additional night in Lapland to enjoy these rooms following your holiday. Please contact one of our Travel Experts for a complete quote. A dog sled safari is one of the highlights of any trip to Lapland. After a short transfer, you will arrive at the husky farm where you meet your eager team. The musher will give you full instructions on how to control the sleds before you set off on the trails with your dogs leading the way. You will travel two people per sled and cover around 10km during the safari. Some hot juice will be enjoyed by a fire en route and there will be the chance to speak with the musher and ask any questions you may have regarding the dogs. The activity lasts around two hours and fifteen minutes. Guides, instruction and equipment included. This activity gives you the chance to visit the city of Rovaniemi (around 1.5hrs from Luosto) where you will have the chance to visit the informative Arktikum museum before heading to the world-famous Santa Claus Village. You will be out for around eight hours in total today, including transfers. This experience is great for those who wish to enjoy an introduction to both snowmobiling and dog sledding. You will be given full instruction before setting off on a snowmobile safari to a nearby husky farm. Here you will meet the dogs who will welcome you with their excited howls. You will be shown how to take control of a sled and given instruction by a musher before you hit the trails for a 4km husky safari. You will travel two people per sled. Back at the farm, a warm drink will be served before you snowmobile back to Luosto. The total activity duration is around three hours. Reindeer are synonymous with Lapland and this activity offers the chance to enjoy a peaceful reindeer sleigh ride. After a short transfer, you will arrive at the reindeer park where the sleighs await. You will enjoy a scenic and peaceful safari through the forest, lasting around 30 minutes. You will enjoy a warm drink and snack around a campfire and gain an insight into the lives of the reindeer herders here in Lapland. Guides, instruction and equipment included. In total, you will be out for around one hour and forty-five minutes. Choose to journey into the depths of Luosto’s natural environment during a guided snowmobile safari. You will be given full instructions on how to operate the vehicles before driving past icy lakes and snow-laden forests. There will be a stop along the way for hot drinks to keep you fuelled up. This activity is based on two sharing a snowmobile (both must have a full driving licence if wishing to drive). It is possible to upgrade to single snowmobiles subject to availability and at a supplement – ask our Travel Experts for more information. This is a great evening for anyone with a keen interest in witnessing the Northern Lights and learning a little more about this natural light show. The evening commences with a multimedia show, hosted by an Aurora expert at the hotel. You will have the chance to listen to real radio signals from space whilst also gaining an insight into the myths and legends which surround the Northern Lights. After your presentation, you will head out to look for the real deal. With your guide leading the way you will be shown to Ahvenlampi, an ideal viewpoint just a short walk from the hotel. Hot drinks will be served around a campfire. This activity lasts around three hours and you will meet in the reception of the Tunturi Hotel. This is a great chance to experience a meal in a traditional Finnish Kota (wooden tepee). Your evening begins with an easy guided walk through the forests around the village to the Kota. Here you will relax around an open fire and enjoy a delicious meal cooked up over the campfire. This is an excellent way in which to really sample a taste of Lapland. The price includes a reduction for your meal at the hotel and you will be out for around three hours in total. The meeting point for this special evening is in the Luosto Tunturi Hotel reception. This activity is ideal for those who are beginners to downhill skiing or perhaps those who have taken a break and are looking to get back into the sport. Luosto's gentle slopes are a great place for some tuition and this group lesson lasts for around 50 minutes. The price includes your tuition, ski pass and equipment. After your lesson you will have an additional hour to enjoy the slopes independently should you wish to do so. You will be transferred from Luosto to Sodankyla, around thirty minutes away. Your destination is the Aurora Kota where an expert will be waiting to receive you in this traditional Finnish tepee. You will be shown a presentation on the Northern Lights and this will provide you with an insight into the science behind this natural phenomenon. This is a fascinating experience for anyone who would like to understand a little more about the magical Aurora. Transfers and guide included and you will be out for around two hours in total. Ice fishing is one of the most popular pastimes in Lapland and this activity offers the chance to combine it with an exciting snowmobile safari. After full driving instructions, you will follow your guide on a snowmobile (travelling two people per machine) through the snowy forests to an ideal fishing spot. Your guide will help you drill through the ice and drop your line into the icy depths, then it is simply a game of patience in the hope that a fish will bite. Warm drinks and a small snack will be served around a campfire as you enjoy the stunning wilderness location. Guides, instruction and equipment included. The total activity duration is around three hours. For those who want to enjoy a longer husky safari, this is a great option. Following a transfer to the farm, you will meet your team of huskies and be given full instructions on how to control the sled. It's then straight out on the trail for a safari covering around 20km. There will be a break for warm drinks and a snack en route. This is sure to be a memorable afternoon in the company of these trusted dogs and will allow you to see some spectacular scenery. You will travel 2 people per team throughout but can swap drivers. Guides, instruction and equipment included. Total duration around three hours. This is a fabulous, full day safari with the huskies. Travelling in pairs, you will be given your own team of eager dogs to work with for the day. Full instruction will be given before you set out on a safari covering between 20 and 30km. You will enjoy a picnic lunch out in the wilds before returning to Luosto, by now you will hopefully be working in tandem with your team – a wonderful feeling! Guides, instruction and equipment included. Total duration around five hours. On this exhilarating tour, you will journey to the top of Lampivaara Fell where you will find Europe's only remaining Amethyst Mine and one of the very best views in Lapland. After a presentation about the gems, you will head down the steps to the mine area where you will get the chance to dig for your own Amethyst (this is a covered surface mine so you do not travel underground). You will travel two people per snowmobile and cover around 10km. Guides, instruction and equipment included. Snowmobile drivers must be 18 years old and hold a valid driving licence. Today you can combine two very Lappish activities as you drive a snowmobile to a reindeer farm. At the farm, you will gain an insight into the lives of the reindeer herders of Lapland and can get up close to some of the animals before a short reindeer sleigh ride. A warm drink will be served prior to your snowmobile ride back to Luosto. Full driving instruction will be given and you will travel two people per snowmobile covering around 30km. Guides, instruction and equipment included. Snowmobile drivers must be 18 years old and hold a valid driving licence. You will be out for a total of around three hours. This activity sees you travelling by snowmobile to a husky farm in order to combine two of the most popular activities in Lapland. Following full driving instructions, you will travel two people per snowmobile for around 12km to reach the huskies. At the farm, you will be given full instruction, before meeting the dogs and setting off on a truly memorable safari of around 10km (again travelling two people per sled). Warm drinks will be served around a campfire. Experience the Arctic Night as you drive snowmobiles through the silent forests and frozen marshland. Ideally, you should do this evening safari having had some experience of snowmobiles earlier in your holiday, however, full instructions will be given. With your headlamps lighting the way your guide will lead you to an ideal Aurora lookout where warm drinks will be enjoyed around a fire. With luck, the Northern Lights will help to guide you back to Luosto. Guides, instruction and equipment included. Snowmobile drivers must be 18 years old and hold a valid driving licence. Total duration around three hours including breaks. Distance travelled will depend on the trail conditions. This is a real adventure for those who want to cover some great distances. Following full instruction, you will set off on a thrilling drive to Pyha Fell. You will travel through forests, across frozen marshes and waterways and take in some of the epic Lappish scenery. On arrival in Pyha, you will enjoy lunch at a local restaurant and fuel up for your return journey. In total, you will have covered around 100km today in six hours and so will be in need of a sauna tonight no doubt. Guides, instruction and equipment included. Snowmobile drivers must be 18 years old and hold a valid driving licence. This is a must for any Aurora hunter as your experienced guide will lead you on snowshoes to the ideal vantage point from which to witness the Northern Lights. Hot drinks will be enjoyed as you await the chance to witness Nature's greatest light show. Guides, instruction and equipment included. You will be out for around two and a half hours. Your guide will take you into the ancient spruce forests which surround Luosto. This is the ideal way in which to enjoy your surroundings and take in the tranquillity of the silent Lappish countryside. You will take a break for a snack en route. Guides, instruction and equipment included. You will be out for around three hours in total and will cover between three and four kilometres. Cross-country skiing is one of the most popular Nordic activities and this is your chance to learn the basic skills. You will be taught the fundamentals before exploring the trails around Luosto, covering between 3 and 5km, over two hours. Many guests like to hire the equipment later in their stay to explore independently as this is a very addictive sport. Guides, instruction and equipment included. This safari offers an ideal introduction to Luosto's scenic surroundings and is designed to offer you some wonderful views. After full instruction and a safety briefing, you will set off on the trails travelling two people per snowmobile. You will skirt around the bottom of Luosto Fell before heading to Keski-Luosto Fell where the landscape opens up and the vistas are spectacular. Your safari will continue with a break for a drink and snack in a warm and cosy kota before you return to Luosto. The activity lasts around three hours and you will cover around 20km in total. Please note: You must hold a full driving licence and be over 18 to drive a snowmobile. An 'Aurora Alert' is an excellent addition to a holiday for any keen Aurora hunter and we can arrange for this to be included for the duration of your stay (subject to availability). Effectively the alert is a mobile phone which receives a text message should the Northern Lights be spotted. These alerts will generally operate until around 1 am but we always advise that you confirm times with hotel staff as they may vary. Book five or more activities in advance of travel (excludes accommodation upgrades and equipment hire) and receive a 5% discount on the total price of your activities. All activities are individually priced. T&C's apply. Minimum of 2 people - during activities the maximum group size is approximately 28 people. Hard to say what we enjoyed most. Just being there was amazing, and I wouldn't like to single out any one. However, the night-time guided snowshoe hike was pretty magical and well and imaginatively guided. We loved the husky sledding as well. Read more the local rep who was very friendly and helpful and a credit to your company. We both really enjoyed the holiday in Luosto, everyone was pleasant and very helpful. All the tours we went on were well planned and in good weather too. Read more informative chat about training the dogs. Read more was a good idea. Simply thought that everything was first class. Vastly exceeded our expectations.